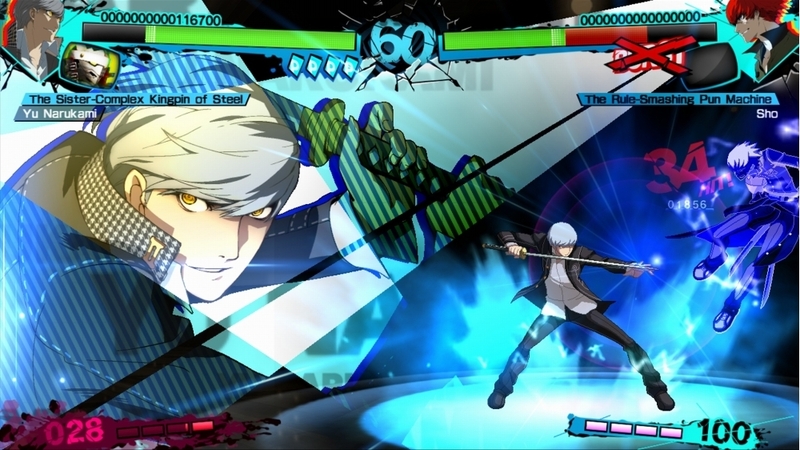 It’s hard to follow up on a game like Persona 4 Arena, which brought the Persona series straight from its consistent turn-based RPG heritage into the world of fighting games, and succeeded spectacularly. Still, Persona 4 Arena Ultimax is ready for the challenge. How does it fare? 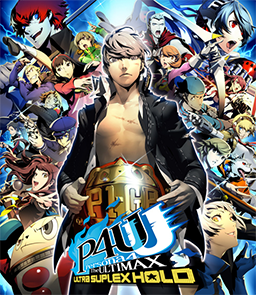 Persona 4 Arena Ultimax is a followup to the original Persona 4 Arena in every way. 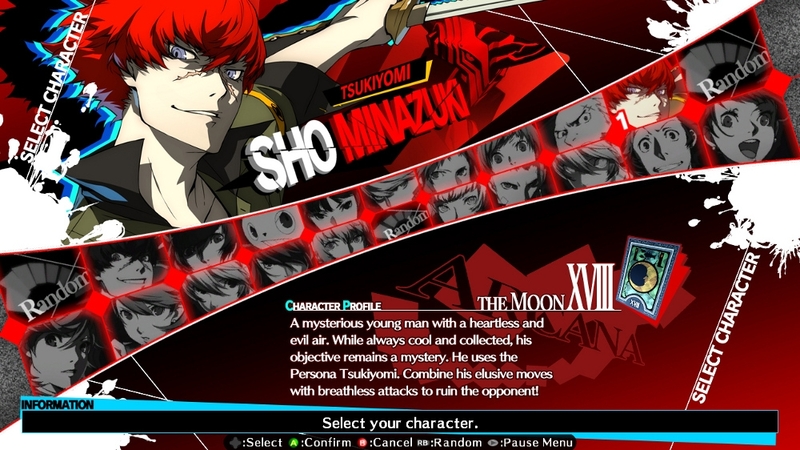 It brings back the 13 characters playable in the original and adds six new ones: one from Persona 4, three from Persona 3, and two villain characters that are new to this game. This brings the playable count up to 19, but, technically, it’s even higher: most characters, but not all, have a Shadow form, which plays much the same with a few key tweaks (more on that later). Plus, that’s not even mentioning any DLC characters such as Adachi. All the non-DLC characters are unlocked right away, too, so right out of the box you can see that this is a bigger game. 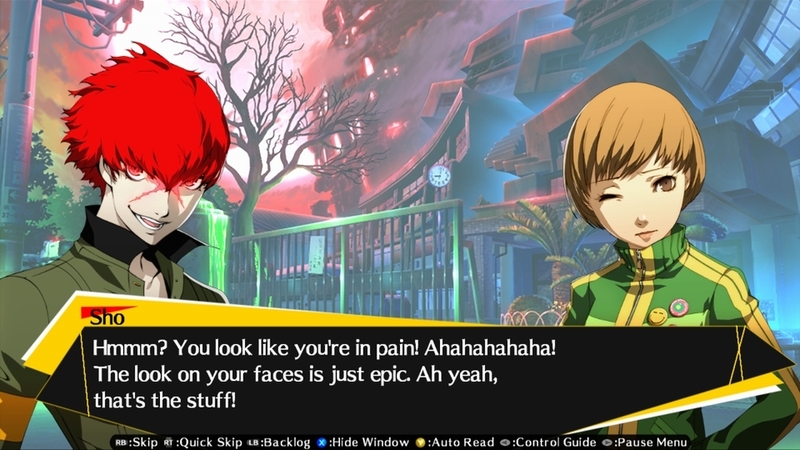 The story mode takes place about a day after the events in Persona 4 Arena. The tournament that the characters were forced to take part in — now called the P1 Climax — is back with a twist. Instead of taking place in the TV world of Persona 4, everything is happening in the real world, but it’s all jumbled together at random and is closer to the Dark Hour from Persona 3. The characters are forced to fight the Shadow versions of themselves and each other, but they don’t try to confuse anyone — it’s as if fighting is itself the point of the mysterious villain’s plan. It’s divided into “Episode P4” and “Episode P3,” the latter unlocking after you defeat the final boss of the former. Still, it’s deceiving to call them episodes, as they tell a different version of the story, with different characters saving the day at key times. Within each episode, though, there’s a pretty consistent plot going on. You’ll follow individual characters at first, going back to several events happening at the same time, but then they’ll begin to meet up and form groups later on. This allows you more choice in who to play as in many battles, which is not to say battles are a big deal in the Story Mode. You’ll spend much more time getting into the story itself, hearing the individual characters reflect on what they’ve figured out. You can even make your character computer-controlled in fights if you want the purely cinematic experience, though, later in the game, you may simply watch them lose the fight. If you would rather get a much smaller dose of storyline with a lot more battling, it’s better to hit Arcade Mode. Most of the characters will be given some short cutscenes between certain fights there (unless they’re the Shadow versions). After defeating the last opponent, you’ll get one last cutscene that is more or less a cliffhanger — inevitably, if you want to know what’s really going on here the actual Story Mode is your ticket. 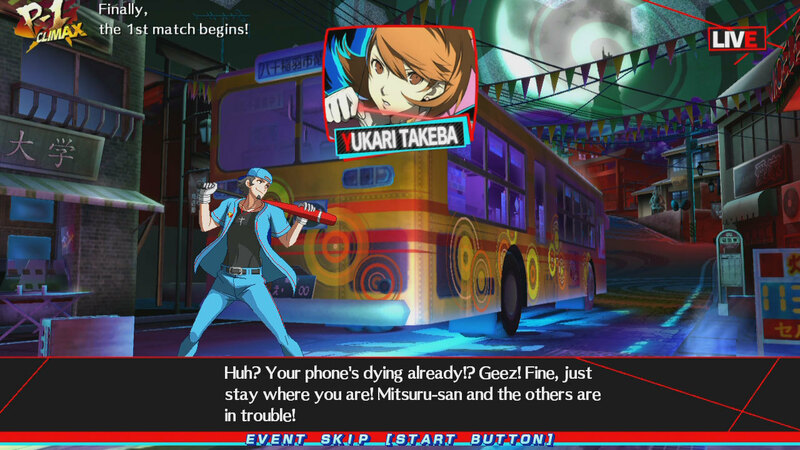 Complementing the Arcade Mode is the return of the Score Attack from the original Persona 4 Arena. 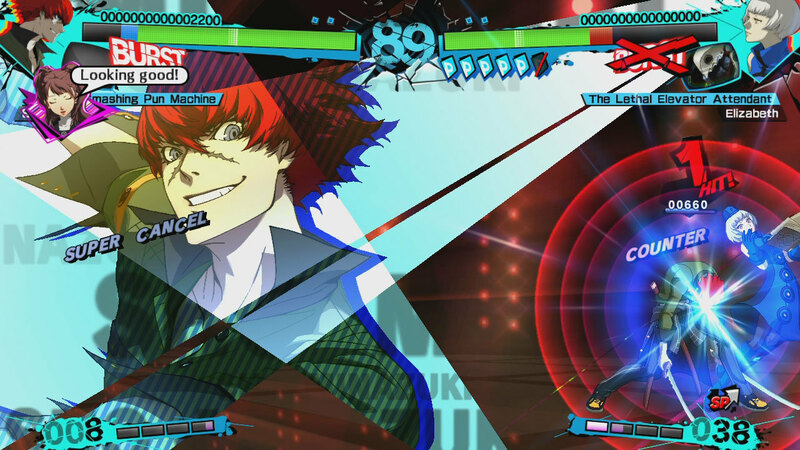 But what really sets Ultimax apart from its predecessor, and makes it madly addicting, is the self-contained Golden Arena mode, which brings it back a little towards RPG territory again. In it, you choose a character and one of four dungeons, each one harder than the last. A dungeon is actually a series of fights — a lot of fights. However, you actually gain experience and level up by defeating your enemies. Besides allocating your stat points, you can keep up to four skills, which you get both from leveling and by defeating the bosses that are scattered throughout each dungeon. Skills may be anything from a speed boost to a constant health regeneration to the ability to put status effects on enemies with your attacks. Of course, enemies have skills, too, and you have to keep your level in mind compared to theirs as you go into harder dungeons. Even the easiest dungeon is 50 battles long, while the highest one challenges you to see how far you can get in an endless mode. Multiplayer also has some cool improvements. You can head to the world lobbies to chat with other players and do casual matches, look specifically for your friends or get serious in the ranked battles. Ranked battles are cool because, even if nobody is available at a given time, you can register for them ahead of time and then go off and play many of the other modes, like Arcade, Score Attack and local Versus matches. When someone is ready to fight you, you’ll get a notification, or you can even set it to instantly stop what you’re doing and load up the online fight. Even cooler, once that battle is over with, you can choose to continue your previous mode, though the particular match you were on will start over if you stopped in the middle. So, there’s been a lot of talk about the modes you can get into — but what, you ask, about the actual gameplay? Essentially, fighting itself is exactly the same as it was in the original. 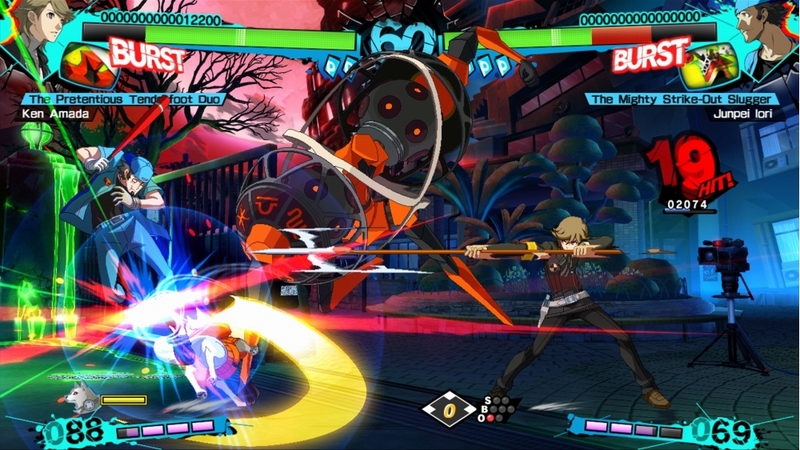 The controls and combos pretty much come right out of Persona 4 Arena, as do things like the combo-breaking Bursts, the use of SP to boost certain attacks and the use of Personas. Once again, there is such a low barrier to entry that even I, a rather incompetent player at most fighting games, was able to make short work of online opponents. Admittedly, most of this was due to the Auto-Combo, the feature that builds up an increasingly powerful combo and then unleashes a massive attack just by mashing one button, but the rest was in quick reaction and carefully moving behind my foe at the right moments. The new characters, for the most part, change things up a bit. Yukari’s long range sounds way too powerful, but, unless you use a more powerful arrow, most opponents can dodge it way too easily. Junpei benefits from more rounds in the fight, as he accumulates “points” through actions that equate to baseball plays, and, when he hits 10, gets a significant upgrade. Ken uses Koromaru almost as a substitute for his Persona, which rarely comes out. Rise… well, she’s a bit tougher to figure out. Then there are the Shadow characters. Basically, they can use the more powerful skills much more often, but they trade off a bit of their base attack and the ability to use Bursts. They also have different voiced lines and entrances, but, other than that, their movesets are the same as the normal ones. It’s an interesting layer of choice that has much more impact than just choosing the color scheme of your character. The beautiful graphics and effects we saw in Persona 4 Arena are all back — there will be a handful of times where you don’t even notice the difference between the two games. The new characters and stages, though, have received the same treatment and fit in perfectly. Similarly, you’ll find that the music is a healthy mix of tunes that were in the previous game, some others brought in from the series in general and a couple of brand new tracks. The voicing is solid in English and covers an extremely full range of lines in every single mode. Turning it to Japanese, on the other hand, can give you some awkward results as certain parts remain in English. So, Persona 4 Arena Ultimax is a lot more than just an expansion of the story and characters of its predecessor. With its update to the online mechanics, and the diehard appeal coming from the new Golden Arena mode, it’s a lot harder to put down, even after trying all the different attractions. Each of the two story episodes is worth about seven hours — for 14 total — but you’ll probably spend a lot more time on the other modes (and we still don’t know how much the DLC will add!) Whether you’re a series fan or just love fighting games, you’d be a fool not to get this game when it comes out on September 30. I hope to see you online!